Last week when I bit into local asparagus that I had gently grilled to a perfect tender crispness I swooned. It was a spurt of green freshness that I hadn’t tasted in way too many months. Fiddleheads, ramps, and asparagus are just the beginning of a whole host of locally grown fruits and vegetables that we have to look forward to over the coming months. Our garden is mostly planted and now we water and wait. Herbs, such as chives (try putting the lavender blossoms in a salad for a colorful burst of flavor) have sprung forth, and radishes and greens will be on their way shortly. In honor of all this spring food goodness, I’ve started doing food photography again. I took a break after completing the Savoring Maine calendar last year because I was admittedly a bit burnt out on standing for hours hunched over a tripod arranging colorful linens and fiddling with fiddleheads. But now with the pressure off and a new season of glorious fresh food awaiting me, I find I’m interested again in photographing the bounty our state has to offer. 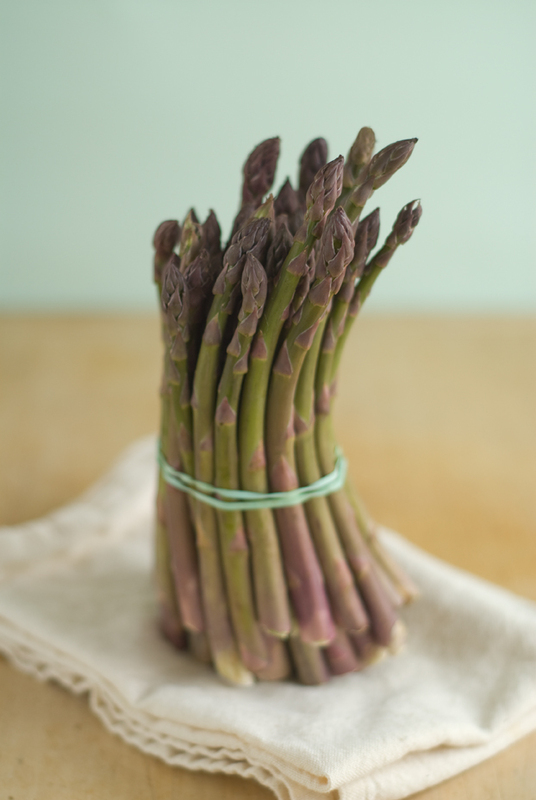 This is a shot of asparagus from Jordan’s Farm in Cape Elizabeth. While at times it can be very frustrating, I really enjoy styling food shots when I end up with something like the shot above. As you can tell, my style is all about simplicity. Not too many props, no artificial light (although I do employ reflectors for bouncing naturally occurring light), and a pleasing assortment of complementary colors. Shape is important too. In the above photo, the wave of the napkin works well with the curve of the spears. And I do have to admit that doing food photography is a wonderful excuse to buy all kinds of fun kitchenware, such as the antique bread board pictured above that I unearthed at a barn filled floor to ceiling with junk gems in Searsport. I would rather people see something that is appetizing and appealing and is more like what you would see in actual life, than an arrangement that makes you want to lose your lunch. But I fully admit I have a lot to learn. And to that end, in June I’m attending the International Conference on Food Styling and Photography in Boston, which I’m really excited about! I can’t wait to pick up some tips and tricks and meet some seminal figures in the food photo and styling world. In the past few weeks, I’ve also had the pleasure of shooting at some Maine eateries for upcoming magazine articles, and it’s been a joy to see how they are all using local foods. I’ll post some of my favorite photos from these shoots after Port City Life’s July/August issue hits the newsstands. In the meantime, get cookin’! This entry was posted in food, Port City Life and tagged asparagus, food photography on May 18, 2009 by Stacey Cramp. Yum! And I have to say that that other asparagus photo (the one you link to under “lunch”) actually made me say “GAH!” aloud, and appreciate your photos even more. Made fiddleheads last week and it felt very artsy to being making fiddleheads next to the May calendar fiddlehead photo (note that I was too lazy to make the recipe, however). Oh good, that was the point! I didn’t have to work very hard to find an unappetizing asparagus photo. I just don’t get how some people shoot food. Do they really think that looks like something you would want to eat? Glad you consumed some fiddleheads, even if they weren’t in the calendar recipe! We’ve been having them with homemade pesto lately and that is a great combination as well. Of course, Scott actually likes making pesto with a mortar and pestle so I’m very fortunate that I don’t have to do the more time-consuming aspects of making that dish! Actually, I use a mortar and pistol. The latter makes it go pretty quickly. I take horrible food photos, but continue to do it because I am under the impression that a poorly lit photo of a brownie is still a better sell than no photo at all.